Internet number resources are distributed globally according to a hierarchical registry system that has evolved over the past two decades. 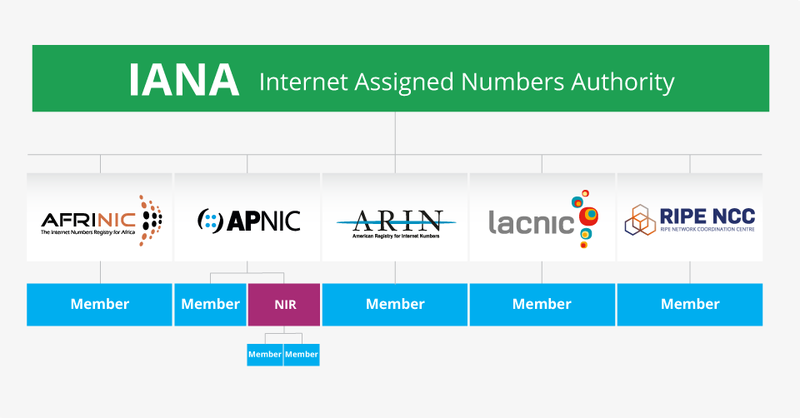 This graph shows how Internet number resources are distributed from the central IANA-managed pool to the five Regional Internet Registries and then onto their Members (Local Internet Registries, or LIRs). * Note that the APNIC community includes National Internet Registries, which distribute resources to their members. The Internet Assigned Numbers Authority has authority over all number spaces used in the Internet, including IP address space and Autonomous system (AS) Numbers. IANA allocates public Internet address space to Regional Internet Registries (RIRs) according to their established needs. The duties of an RIR include the coordination and representation of the members in its region. Additional RIRs may be established in the future, although their number will remain relatively low. The RIRs work closely together to develop consistent policies and promote best current practice for the Internet. Some RIR coordination activities are done under the umbrella of the Number Resource Organization (NRO). LIRs are established under the authority of an RIR. LIRs are typically operated by Internet Service Providers and serve the customers of those ISPs. Other organisations such as large Enterprises can also operate LIRs. Much of this document is concerned with the responsibility of the LIR in the assignment process. In some cases, the LIR assigning the address space is not run by the ISP that will provide connectivity. It is important to note that the maintenance of the administrative information regarding the assigned address space is the responsibility of the LIR that makes the assignment and not of the ISP providing the connectivity. Furthermore, only RIRs and LIRs can hold address allocations. An entity that uses IP address space for its network only and does not provide IP/ASN services to customers is called an End User. Strictly speaking, End Users are not part of the Internet Registry System. They do, however, play an important role with respect to the goals defined above. In order to achieve the conservation goal, for example, End Users should plan their networks to use a minimum amount of address space. They must document their addressing and deployment plans to the LIR and furnish any additional information required by the LIR for making assignment decisions. To achieve the aggregation goal, an End User should choose an appropriate LIR. End Users should be aware that changing ISPs may require replacing addresses in their networks. End Users must provide and update registration data for the address space assigned to them in the RIPE Database. In addition to these key players in the Internet Registry System, there are often consultants who set up and manage networks for End Users. The consultants may be the persons submitting a request for address space to an LIR on behalf of an End User. We refer to the person making the request for an End User as a requester, whether that person is employed by the organisation, or is simply acting on behalf of the organisation with respect to the address space request.